The creamy, lemon scented elder blossom are in bloom. These flowers are a great remedy for fevers, colds, flu, hay fever and hot flushes. The flowers are packed with bioflavonoids that has been used throughout the world in traditional medicine. They are also anti-inflammatory, anti-bacterial, anti-viral, anti-cancer and an antioxidant. This herb will help boost your immune system and research has shown that it can also be effective in killing common pathogens. You may have tried some of the delicious elderflower drinks available on the market now. 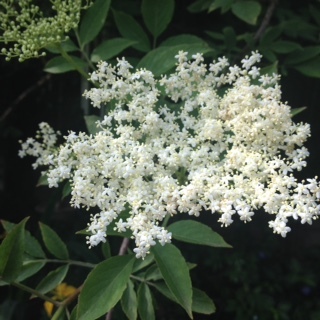 Why not try making your own elderflower cordial or make your own tea? Now is a good time to pick your flower heads, try and wait for a dry sunny day, choose those blooms that have that lovely fresh lemony scent. The Elder has such a short flowering season it is a good idea to dry some of the flowers too. If you spread the flowers on some brown paper and leave to dry and then then remove the flowers from the stalks. To make Elderflower tea you can use fresh or dried flowers. Use a teaspoonful of the flowers for each cup. Allow to infuse for about five minutes and strain before drinking. If you are in the early stages of a cold drink frequently whilst hot. It’s good for promoting sweating to break a fever. The tea has also been recommended as a spring tonic, Mrs Grieves herbal recommends it to be taken every morning before breakfast as an excellent blood purifier. If you are suffering from hay fever make the tea with nettle tops too. The tea is said to also help with hot flushes, drink the tea cold to relieve symptoms. Elderflower can also reduce blood sugar levels in a similar way to how insulin works. To make Elderflower cordial boil gently1 kg of sugar in 2 litres of water for a few minutes, Pour into a large ceramic bowl and add about 30 elder flower heads, a chopped lemon and 50g of citric acid. Stir and cover with a cloth Stir daily and leave for 4 days and then strain and bottle.